Ferrocarril topped Group A. 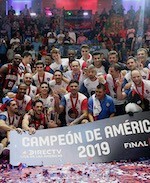 They upset hosting Fuerza Regia to secure the third win in a row. Mauro Cosolito (195-SF-88) and Jose Ignacio Alessio (203-C-87) recorded 18 points each for the Argentinean team. Ferrocarril dominated throughout the first half. They accumulated a 50:31 halftime lead. Fuerza Regia narrowed the gap in the second half but could not avoid the loss. Martin Cuello netted 11 points for the winners. Benoit Mendzana answered with 19 points for Fuerza Regia. Soles finished their Liga Americas campaign on a high note. They defeated Arecibo for 1-2 record. Kohl Meyer (190-G, college: Puget Sound) scored 21 points to lead the charge. Soles posted a 32:14 lead ten minutes into the game. Capitanes pulled within 7 points at the final intermission however Soles knocked down 23 points in the fourth period to ice the win. John Flowers (200-F-89, college: W.Virginia, agency: Octagon Europe) added 20 points for the winners. Jezreel De Jesus (185-G-91, agency: Interperformances) answered with 23 points, 7 rebounds and 5 assists for Arecibo.